I’m generally not a big fan of boneless, skinless chicken breasts on the grill. For me, they almost always end up being dry and bland. 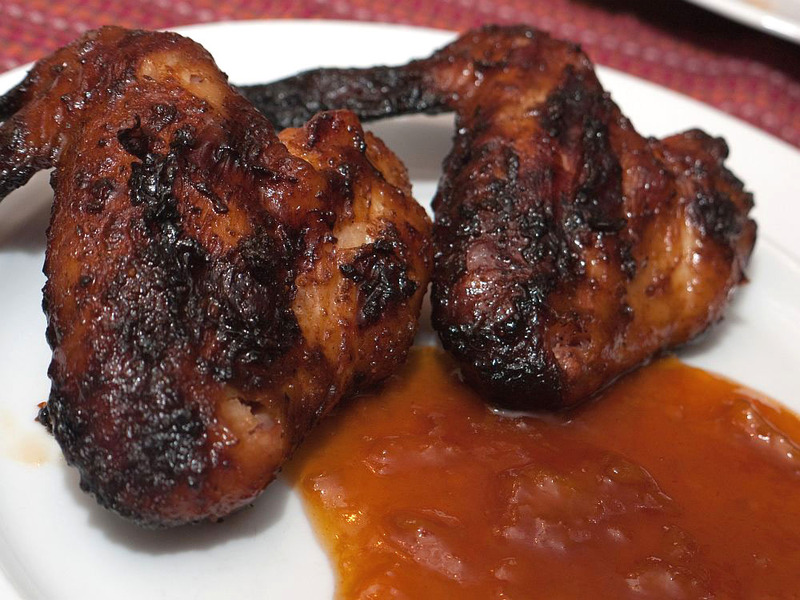 This recipe is reminiscent of the well-marinated chicken you’ll find sizzling on top of old oil drum grills all over the Caribbean. It uses both a marinade and a baste to keep the breasts juicy and tangy. Put the salt and garlic in a food processor and pulse until the garlic is minced. Add the remaining ingredients, except the chicken, and give them a whirl until they are well-combined. This makes just under 2 cups of marinade. Reserve a half cup for basting the chicken. Put the chicken in a freezer bag and coat with the remaining marinade. Squeeze the air out of the bag and seal. Marinate in the refrigerator for at least 4 hours, overnight is better, 48 hours is amazing. Set your grill up for a direct cook over medium-high (400°F) heat. Put the chicken on the grill and close the lid. Cook for about 5 minutes, then flip and baste with the reserved marinade using a basting brush or mop. Flip and baste every five minutes. Cook for about 30 to 40 minutes, until the juices run clear and the meat is no longer pink in the center, or until you reach 160°F internal. This is another take on the Chicken & Veggies dish that we tend to make a lot in late summer. I think this one is even a little easier. After spatchcocking the bird (which is easier than it sounds) and slicing the veggies, the cook pretty much takes care of itself. If you get your grill started first and then prep everything while it heats up, you can put this meal on the table in about 90 minutes flat. 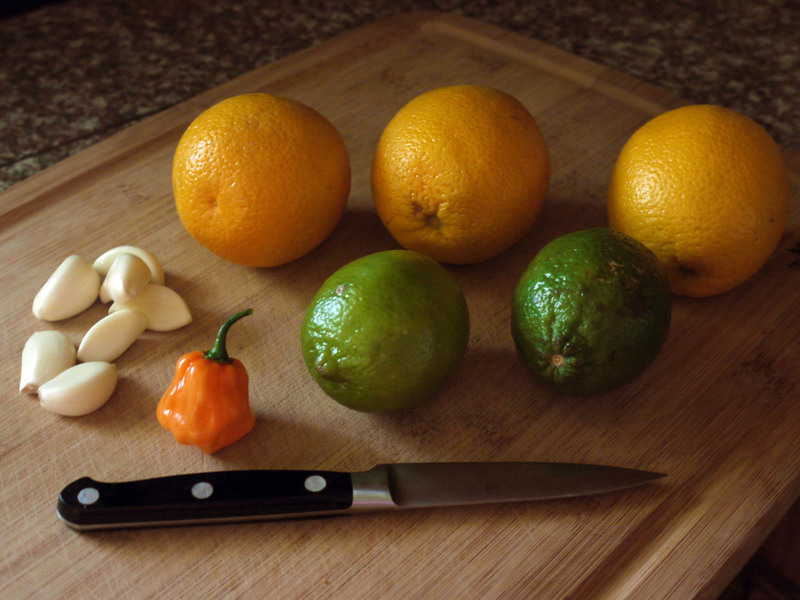 Make a vinaigrette by putting the salt and garlic in a food processor and pulse until the garlic is minced. Add the oil, vinegar, and mustard and give them a whirl until they are well-combined. Lightly oil a disposable foil pan. Add the veggies and cover with the vinaigrette. Mix well. Clean and rinse the chicken, then pat it dry. Place the bird in front of you, breast side down. Spatchcock the bird by cutting up through the backbone with either a pair of kitchen shears or a sharp chef’s knife. Spread the bird open like a book and locate the keel bone that sits between the breasts. Nick it with a knife to get it to open up, but don’t cut all the way through. Flip the bird over and press down on the center of the bird until it lies pretty flat. Rub both sides of the bird with olive oil and season with the rub, making sure to work some under the skin. Set your grill up for an indirect cook over medium-high (400°F). Set the pan full of veggies on the grill. Place a small wire rack or grill grate on top of the pan. Lay the chicken, skin side up, on the grate above the veggies. Close the lid and cook the chicken and veggies for 45 minutes – no flipping, no basting, no checking. After 45 minutes, start checking to see if everything is done. 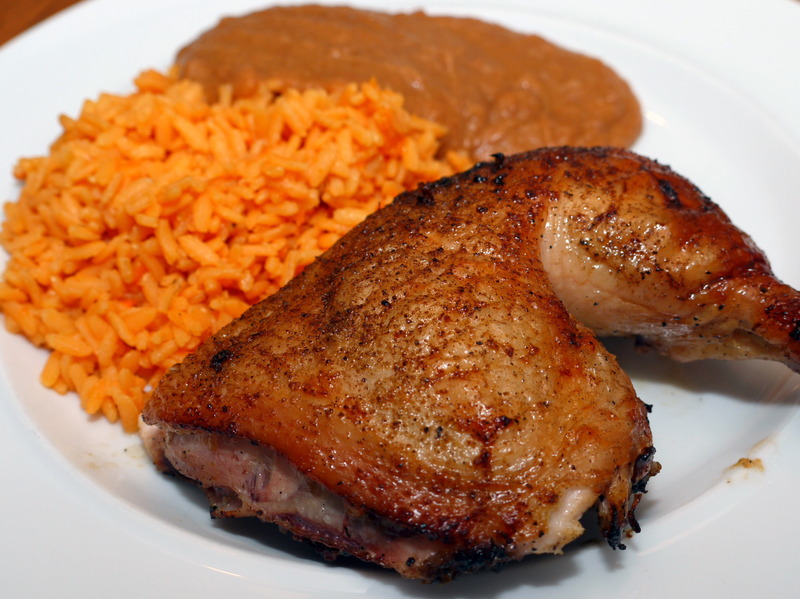 The chicken is done when the juices run clear and the the temperature has reached 160°F in the breast and 180°F in the thigh. Pull the veggies if they finish before the chicken. Yeah, it sounds mighty fancy, but it’s just butterflied chicken with a lemon herb marinade. Flattening the bird evens out the cooking so the white meat doesn’t dry out by the time the dark meat is done. The gremolata and the baste add a ton of flavor and keep everything juicy. Prepare the gremolata by putting the salt and garlic in a food processor and pulsing until the garlic is minced. Add the remaining ingredients, except the chicken, and give them a whirl until they are well-combined. Clean and rinse the bird, then pat it dry. Place the bird in front of you, breast side down. Spatchcock the bird by cutting up through the backbone with either a pair of kitchen shears or a sharp chef’s knife. Some recipes recommend cutting out the backbone entirely, but I think that just cutting though it once is enough. Spread the bird open like a book and flip it over. Press down on the center of the bird until it lies pretty flat. If it won’t flatten, flip the bird back over and use a knife to nick the keel bone right between the breasts and try again. Put the chicken in a Ziploc bag and coat with the gremolata. Squeeze the air out of the bag and seal. Marinate in the refrigerator for at least 2 hours, overnight is best. Set your grill up for a direct cook over medium-high (400°F) heat. I like using a raised grid on the Big Green Egg to help even out the cooking temperatures. Prepare the baste by melting the butter and adding the salt and lemon. I really like the Lodge Cast-Iron Melting Pot for this. 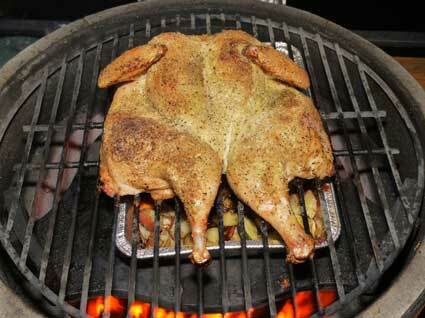 Put the chicken on the grill skin side up and close the lid. Cook for about 15 minutes, then baste. Cook for another 15 minutes, then flip and baste. Flip again so the skin side is up and baste. Continue to cook, basting every 10 minutes or so, until the thighs hit 180°F internal – about an hour total cook time. Remove the chicken to a cutting board and let rest for 10 minutes. Cut into quarters and serve. I like this setup for a quick summer meal. The chicken juices drip onto the veggies (making them extra tasty), and the pan full of veggies protects the chicken from direct heat so it stays juicy. Combine the honey, mustard, salt, chile, and lime juice in a large container with a lid. Mix well. Place the chicken in the container, seal, and turn until well-coated. Marinate in the refrigerator for at least 4 hours, but preferably overnight, turning the pieces occasionally. Combine all of the ingredients in a disposable foil pan. Mix well. Set up your grill for a direct cook over medium (350°F) heat. Set the pan full of veggies on the grill. Place a small wire rack or grill grate on top of the pan. Lay the chicken breasts skin side up on the grate above the veggies. Close the lid and cook for 30 minutes. Lift the grate with the chicken on it off the of the pan and give the veggies a stir. Add more oil if they are starting to stick. Put the grate back on the pan and flip the chicken. Close the lid and cook until the breasts reach 160F internal (about another 30 minutes). 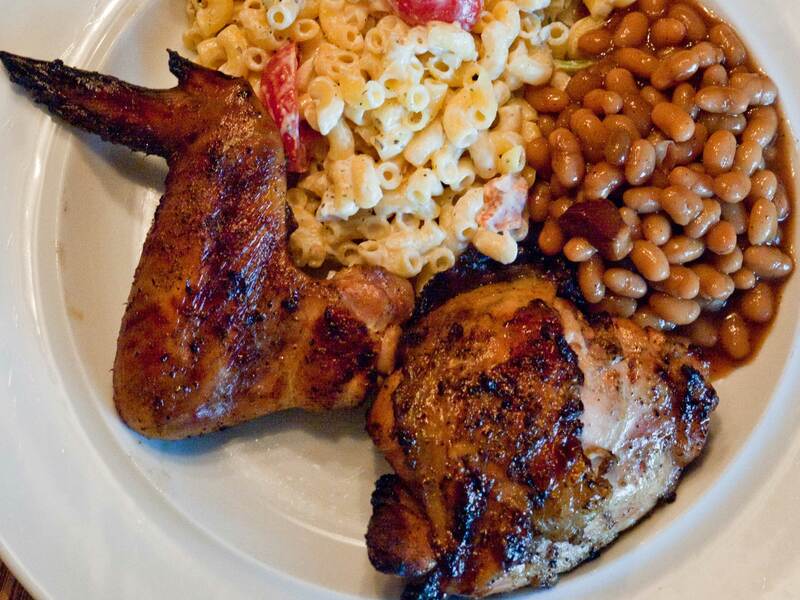 This is yet another grilled chicken recipe that really benefits from the marinade. In this case it’s a simple, tangy Argentinean chimichurri that combines herbs, lemon, and garlic to deeply flavor the chicken and keep it moist. Put the salt and garlic in a food processor and pulse until the garlic is minced. Add the remaining ingredients, except the chicken, and give them a whirl until they are well-combined. Put the chicken in a freezer bag and coat with the sauce. Squeeze the air out of the bag and seal. Marinate in the refrigerator for at least 2 hours, overnight is best. Set your grill up for a direct cook over medium (350°F) heat. I like using a raised grid on the Big Green Egg to help even out the cooking temperatures. 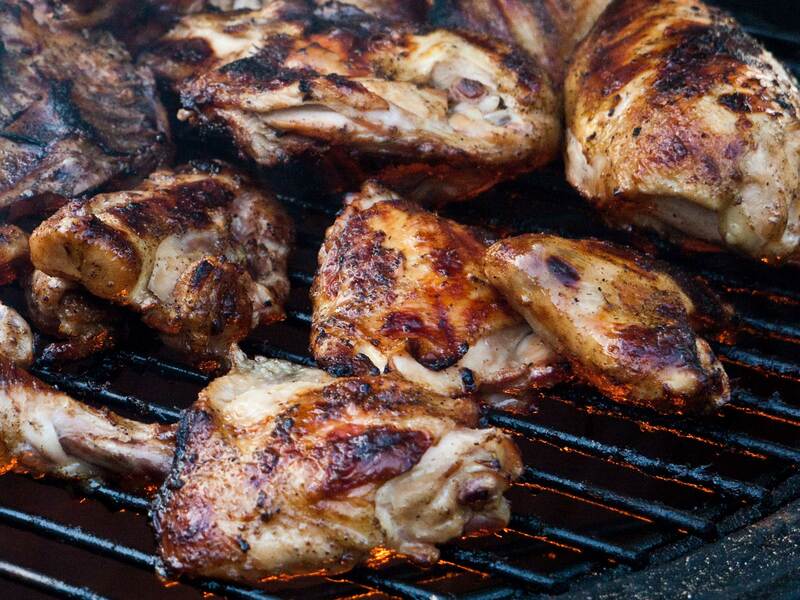 Put the chicken on the grill and close the lid. Cook for about 10 minutes, then flip. 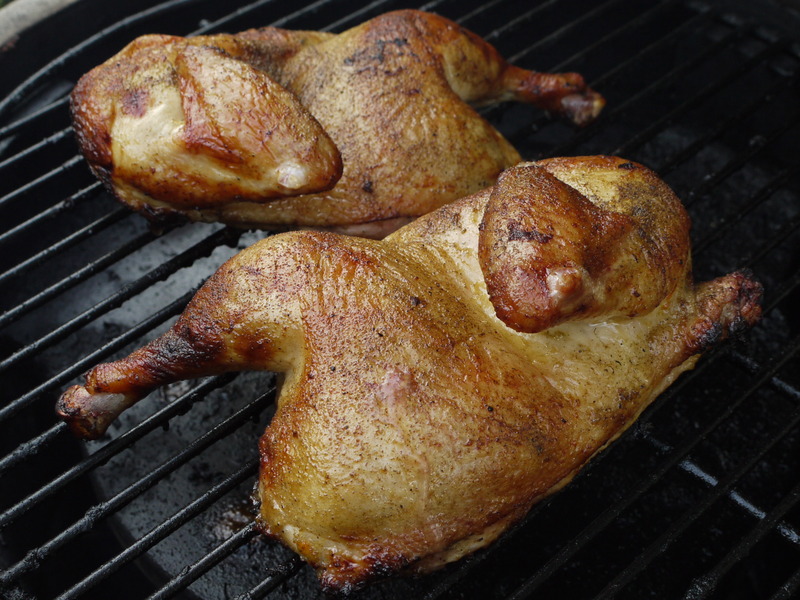 Flip again every 10 minutes until the thighs hit 180°F internal – about 40 minutes. Buttermilk makes an excellent brine for chicken. It does a great job of penetrating the meat, so the chicken stays moist and the flavor of the spices go all of the way through. Combine the buttermilk, salt, hot sauce, Worcestershire, and spices. Mix well. Add the chicken and turn to coat. Marinate in the refrigerator overnight, turning the pieces occasionally. Remove the chicken pieces from the marinade and put on the grill. Grill for about 40 minutes, flipping every 10 minutes or so, until the juices run clear or when a meat thermometer reads 180°F when inserted in the thickest part of the thigh. I served this with baked beans and a Summer-y pasta salad. This marinade produces some of the tastiest chicken I have every grilled, and the sweet potatoes and peppers are the perfect side dish. Don’t be afraid to use the full 2 tablespoons of salt. It seems like overkill, but the chicken is heavily spiced enough that it really brings out these other flavors. Combine the yogurt, oil, lemon juice, salt, and spices, then add chicken and turn until coated well. Marinate in the refrigerator for at least 4 hours, but preferably overnight, turning the pieces occasionally. Combine the pepper, onion, oil, lime juice, salt, and spices, then add sweet potatoes and turn until coated well. Marinate in the refrigerator for at least an hour. Set up your grill for a direct cook over medium-high (400°F) heat. Using a slotted spoon, remove the vegetables to a vegetable basket or griddle, reserve the marinade. Grill the vegetables for about 6-8 minutes, until grill marks appear and they begin to soften. Turn and grill the other side for another 6 minutes. Return vegetables to the reserved marinade, toss to coat and set aside. Remove the chicken pieces from the yogurt marinade and put on the grill. Grill for about 40 minutes, flipping every 10 minutes or so, until the juices run clear or when a meat thermometer reads 180°F when inserted in the thickest part of the thigh. This is a quick and versatile alternative to grilling plain, old chicken breasts. The stuffing provides a lot of moisture and flavor to what could otherwise be a pretty bland piece of meat. I used a bacon, basil, and Parmesan cheese combination for this recipe. Other tasty combinations include ricotta, spinach, and prosciutto; or mozzarella, deli ham, and parsley. Season both sides of the breasts with lemon pepper and a little salt. Put the breasts between two sheets of plastic wrap and pound firmly with the smooth side of a tenderizing mallet until evenly flattened and about a 1/4 inch thick. Remove plastic wrap and top with the fresh basil, bacon, and cheese. Roll up tightly and secure with a couple of toothpicks. Grill the rolls seam-side up for 10 minutes, flip and grill until the rolls are done, about another 10 minutes. They should be golden brown and the inside temperature should be 160°F. Remove to a cutting board and let rest for 5 minutes. Cut the rolls into 1-inch rounds for serving.